Eye surgery is widely acclaimed as being a relatively safe and easy form of surgery that in most cases can happen out of hospital and in a day clinic or medical room under a local anaesthetic. When a patient is considered unsuitable for eye surgery, it is usually because in a very few cases eye surgery is not recommended or is considered unsafe when the patient has other health problems or if the eye problem itself will not improve with surgery. (Doctors use the term contraindicated to describe a treatment that is not recommended for a particular type of health condition). What are the Major Reasons Given for Why Can’t I Have Eye Surgery? Pregnancy and child birth are contraindications for the treatment due to the hormonal changes that take place in the eye when oestrogen levels are reduced. There is a risk that the surgery will not be successful and the healing process will be affected if a woman has the procedure during these times. Men and women over 40 also are cautioned against laser therapy in some clinics due to the effects of the aging process. 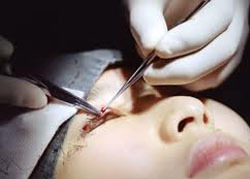 The healing processes are affected in such diseases as leukaemia and other auto immune and immune deficiency conditions and this may result in doctors preferring to delay surgery until a person is in the best possible physical condition or to suggest that surgery is not the best option to treating the eye problems being experienced by the patient. Patients with some medical conditions involving circulation of the blood may also be cautioned against procedures as may those with some eye conditions associated with age or eye defects that will not be affected or helped by the surgery. Young children particularly fit into this category if their vision functions are still developing in the brain. Some medications that a patient takes may also provide a reason why eye surgery cannot be performed. This may be a temporary situation until the patient can safely cease taking the medications. What can I Do if I am Told I Can’t Have Eye Surgery? Patients have the option of seeking a second opinion. Many doctors hold differing opinions on age and other reasons for not performing surgery on different patients and a second opinion may enable you to make an informed decision based on your own reading and the advice of your doctor. It may also be advisable to discuss the situation further with your doctor who may be able to discuss other treatment options that could prove more successful treating the condition you have been diagnosed with. Children in particular may not be candidates for laser or other surgical intervention, but may have significant improvement in their conditions when they are provided with eye exercises and not surgical treatment options like eye pads to help improve vision. In most cases, your doctor will volunteer other treatment options to you and may arrange a follow up appointment to both assess the progression and any worsening of your vision, and also to assess whether a surgical treatment is then needed.